Printed by Thomas Mairs, Joy's Entry, 1834. Henry Bayly was an assistant in a lawyer's office in Lisburn, and the son of a Dublin solicitor. 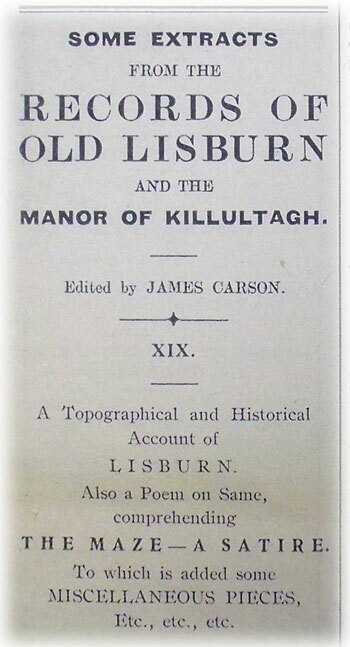 In the preface to his Poems he speaks of himself as "the Lisburn historian" and "the Lisburn poet." The historical part of the book runs to some 69 pages and the poetical to 156. As was to be expected, his historical facts are frequently only a repetition of those given by his predecessors -- Johnston and Bradshaw. The book contains a list of subscribers. It also gives "in extenso" an account of the Battle of Lisburn, 1641, and a copy of the Charter, 1662, which erected the church at Lisburn into a cathedral and empowered the return of two Members for Lisburn to the Irish Parliament. These two documents have already been "Extracted," and may be found in Article V.
Lisburn is situate in the barony of Massereene, on the river Lagan, in the county of Antrim, and is seventy-three miles north of Dublin, and something more than six south of Belfast. It is acknowledged to be the handsomest inland town in Ireland. It is the second town in the county Antrim, not only for size, trade, and population. but also as regards political and religious supremacy, moral influence, wealth and enterprise. In the reign of Queen Elizabeth, Lisburn was only a small village, and at that period called Lisnegarvy. The town having been fired by the rebels, in 1641, was the origin of the name being changed. The original proprietor of the territory Killultagh, in which it stands, was an O'Neill of the Tyrone family. In the reign of James I. Sir Fulk Conway obtained a grant of it. He induced a number of English and Welsh families to settle here. From a plan of the town taken, it is thought, sometime in that reign, and preserved in the Marquis of Hertford's office, it appears that there were then fifty-three tenements in the place besides the Castle. From this plan it is evident that the centre of the town (all that was then in existence) has undergone but little alteration in shape, the streets still remaining in the same form as when laid out in the reign of James I. except what has been occasioned by the buildings near the market-house; nor for many years after does it seem to have made any great progress; for in 1635, it was thus described by an English traveller -- "Linsley Garvin, about seven miles from Belfast, is well seated; but neither the town, nor country thereabouts, were planted (inhabited), being almost all woods and moorish, until you come to Dromore. This town belongs to Lord Conway, who hath a good handsome house there." Lisburn is remarkable for a victory gained over the Irish rebels, commanded by Sir Phelim O'Neil, Sir Co Magenis and General Plunket, on the 28th of November. 1641, a little more than a month after the breaking out of the Rebellion; Sir George Rawdon, who commanded the King's forces, having arrived at Lisburn on the evening before the battle. 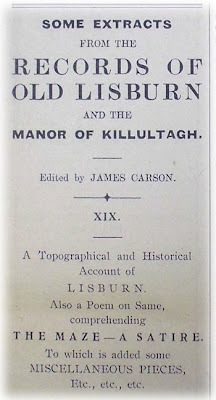 In 1662, the inhabitants of the town of Lisburn, on account of their loyalty to Charles the 1st and 2d, were (by the same patent which erected the church of Lisburn into a Cathedral for the united diocese of Down and Connor) empowered to return two Burgesses to Parliament for ever, the Sheriff of the county of Antrim, upon all summonses to elect a Parliament, being obliged to send his precept to the Seneschal of the Manor of Killultagh, (done at this day) who was made the returning officer, notwithstanding the inhabitants were not a corporate body. the same is become the head of the corner." About 50 years ago, and recently, many new houses have been built in Lisburn, three and four stories high, and well slated. The majority of the houses in Castle-street are, in appearance, equal to some of the best in Dublin. Lord Hertford's mansion, opposite the castle gardens, is a noble one, the rere of which is a most delightful view. Of late years, some public-spirited shopkeepers have made principal in Belfast. Among those who have thus shown a taste for improvement, may be mentioned, Mr. Crossley, proprietor of the Hertford Arms Hotel, Mr. Greeves, Mr. John Moore, Mr. Chapman, &c.
The places of worship are -- 1. The Cathedral. 2. Presbyterian Meeting-house. 3. The Society of Friends Meeting-house. 4. Chapel of the Wesleyan Methodists. 4. Methodist Refuge Chapel. 6. Roman Catholic Chapel. This venerable edifice is huge and commodious. It was originally built (we believe) early in the reign of James I. and was then called the Church of St. Thomas. It was destroyed by the great fire of 1707, but rebuilt immediately after. In the reign of Charles II. it was by patent "hereinbefore stated," bearing date the 27th October, 1662, erected into a Cathedral for the united diocese of Down and Connor. The architecture is on the plain model and well proportioned. The interior is lighted by six spacious windows, and one great window on the east, of Saxon construction. The entrance is by two fine wrought-iron gates, one on the west, and the other on the north. The beautiful lofty spire of cut stone is admired by all travellers, and accounted the best in Ireland. It forms the principal ornament of the town, being recognised at a great distance on all sides. There is a handsome clock and chimes; likewise, a valuable bell of very superior tone, the gift of the late Marquis of Hertford. The hour is proclaimed very loquaciously with eight tongues. A very splendid organ has been recently erected, by Small, Bruce and Co. of Edinburgh, at the expense of Lord Hertford; the cost was upwards of £300; two excellent stoves have been also fitted up. A magnificent chandelier lights the Cathedral by night. About ten years since, two spacious galleries were erected, and the Cathedral is now capable of accommodating a thousand persons. We suppose the cost of erecting this fine building (including the late improvements) must have exceeded £2000. The congregation is very numerous and respectable; the majority of the population in and about Lisburn, are members of the Established Church. The living of Lisburn, alias Blaris, is a rectory in the gift of the Marquis of Hertford. The parish contains twenty-six townlands. The present rector is the Rev. Snowden Cupples, D.D. Curates, Rev. T. Thompson and Rev. R. Bridge. 1. A very elegant marble slab, erected to the memory of the celebrated Bishop Jeremy Taylor, who died at Lisburn. 2. A monument to the memory of the Rev. Saumerez Dubourdieu, who was the minister of the French Hugonots that settled in Lisburn. 3. A neat monument, erected to the memory of the gallant Lieutenant William Dobbs, who was killed in an engagement with the famous Paul Jones, in the year 1778. He was of his Majesty's ship "Drake." 4. A fine monument to the memory of the late Rowley Hall, Esq., who was LAw Agent to the Marquis of Hertford, and who was a man universally esteemed for his worth, integrity, and philanthropy. This edifice, to which you enter from Market-square by a good wrought-iron gate, was built in the year 1768. It is a large building, well lighted with twenty-three windows, and has three fine galleries. The expense of building was between £800 and £900. Within the last ten years the galleries have been enlarged, and the house is now capable of accommodating upwards of a thousand persons. The cost of this, with other improvements, exceeded £260. The Presbyterian congregation of Lisburn consists of more than five hundred families. The house opens for divine service on Sundays at twelve o'clock; and for the last eight or nine years, there has been also preaching at six o'clock in the evening of the same day. There is also a religious lecture given every Wednesday evening, and a prayer-meeting held every Thursday, at seven o'clock, p.m. It is the particular practice of the Presbyterian pastors, to visit their hearers through the week, at their houses. They also preach in schools, and other places in the country districts, during the week. The average amount of stipends received by the minister of the Lisburn congregation, is about £150 per annum; which, with the Royal Bounty of £100, makes £250, as the annual income -- a sum moderate enough for the duties and services performed, and the outlay necessary. In the succession of ministers belonging to this congregation, we find some who have eminently distinguished themselves for their labors, learning, and talents. Doctor William Bruce has been remarkable, as belonging to a family that has produced seven ministers in regular succession, from the Reformation to the present day. Doctor Bruce is now the minister of the first Presbyterian congregation of Belfast, and principal of the Academy, and has acquired considerable reputation as an author. The Rev. James Morgan possesses talents of a very superior order, and is one of our ablest champions of Christianity; he has published several excellent sermons, upon various subjects. for the space of 42 Years. The Rev. gentleman returned a very suitable answer. In the spring of 1829, the Rev. Alex. Henderson succeeded Mr. Morgan, that gentleman, having been called to Belfast. He is and exemplary clergyman, an excellent preacher, and a man of sterling Christian worth. This is a plain, neat, commodious edifice, the entrance to which is by a long confined passage, from the main street of the town. Had this building, as well with the Presbyterian Meeting-House, been placed in a parallel line with the front street, and not built so far in the rere, they would add much to the beauty and symmetry of the town. The lower part of this building escaped the fire of 1707, and is still remaining. Wherever the Quakers have formed their settlements, their persevering industry and undeviating integrity have been highly advantageous to the commerce, the manufactures, and the agriculture of the surrounding country. The people are so much benefited by their labor, and improved by their example, that a debt of gratitude is due by society at large to this invaluable community. William Edmunson was the first zealous Quaker preacher who settled in Ulster. About the year 1651, he married, left Cromwell's army, passed over from England to Dublin, and from thence to Antrim, where he took a house, in which his wife and his brother resided with him. Shortly after this period he revisited his native country, where, having heard the celebrated George Fox expounding, with his usual eloquence, the principles of the Quaker religion, he was convinced by the spirit of Christianity. On his return to Antrim, in the year 1653, he astonished the officers at the custom-house, in Carrickfergus, by refusing to take the oaths required by law, on entry of his goods, "because," said he, "Christ hath forbidden men to swear." A.D. 1634. William Edmunson removed from Antrim to Lurgan, (ten miles from Lisburn). He was scarcely settled in his new habitation, when he found himself enabled to form a regular periodical meeting of "the Friends" under his own hospitable roof. This was the first religious assemblage or congregation established in Ireland by the Quakers. It will reflect eternal credit on the Quakers of Ireland, that from them issued the first censure, passed by any public body, on that abominable traffic, the Slave Trade. This took place at the National Meeting, held in Dublin in 1727, thirty-one years before a similar resolution was passed by the yearly meeting of Friends in London. CHAPEL OF THE WESLEYAN METHODISTS. The ground on which this place of worship is erected, was granted for ever by Edward Gayer, Esq. of Derriaghy, vested in seven trustees. It was built in the year 1772, and cost about £500. The exterior is plain, though not inelegant. The interior is lightsome, well ventilated, and handsomely fitted up. About the year 1780, the Rev. John Johnson, the then resident preacher, gave £150 (upon certain conditions) towards enlarging the house thirty-six feet longer, so that it is now sixty-six feet in length, and thirty-six in breadth. Under the tasteful superintendence of Mr. Bolton, it has recently undergone many improvements. A neat house has been attached for the convenience of the classes and leaders meeting. A handsome wrought-iron gate has been also added, which much improves the general appearance of the place. These improvements cost about £60. A Sunday-school has been lately established, and is attended by about fifty children; the members of the congregation acting occasionally as teachers. Public worship is held in this house at eleven o'clock, a.m. every Sunday; also at seven in the evening. A sermon was preached formerly every Thursday evening, but it has been recently changed to Monday. We think the old-appointed time suited the purposes of piety better. The eucharist is administered once a quarter, on the second Sunday in the month. A prayer-meeting is held here every evening in the week (except on Saturdays) and occasionally the members have meetings at one another's houses, for the purposes of prayer, exhortation, and Christian communion. The present preachers are, the Rev. Michael Burrows and the Rev. Edward Johnson. Methodism was introduced into Lisburn by the Rev. John Wesley, in about the year 1760, when he preached in a small house in Bow-street, since which period it has made a very rapid progress. The average number of members in attendance at this house is 300. This place of worship is erected on a site opposite the chapel just noticed. It is a neat building, and is occupied by a dissenting branch of the Wesleyan Methodists. This is a neat handsome building, in a retired part of the town, and was erected about the year 1794, by subscription from all denominations. Since its erection, owing to the increase of its members, there has been an aisle and two galleries add. The Roman Catholics have recently built a good dwelling-house for their clergyman (in the vicinity of the chapel), aided by general subscription. The Marquis of Hertford granted the ground, with a donation of £20. It is owning to justice to state, that, the Rev. Mr. Smyth, the R.C. clergyman, has uniformly distinguished himself, by his philanthropy, in attending and giving advice to the sick poor of all denominations, his vast medical knowledge enabling him to be a physician of bodies as well as souls. Mercer, Col. Edward Smyth. -- "Mount Carmel," a poem, London, 1866; "The Mercer Chronicle," in verse, London, 1866. The last-named work is a rhymed history of the Mercer family, with learned notes attached. He was the son of Col. E. S. Mercer (who died December 24, 1847, and is buried in Lisburn Cathedral), and was probably a native of County Down like his father. He was a descendent of the Mercers whose deaths are recorded on a tablet in Lisburn Cathedral. The first of the name, John Mercer, came from Scotland and died about 1636. John, of Castle Robin, Derriaghy, died 1726; John, of Hill Hall Court, died 1731; and a long list of other deceased Mercers and relatives follow. Sir Moyses Hill, ancestor of the Downshire family, commenced the erection of a mansion and stronghold about the year 1600 that afterwards became known as Hill's Court, Hill Hall Court, and the Hall of the Hills. It is described as situated on a piece of rising ground at a picturesque spot not fox distant from the hamlet of Lisnagarvagh. Francis, the grandson of Sir Moyses, who ultimately completed the construction of Hill Hall Court, died in 1655, and was buried in the family vault of the Lisburn Church. The Hill family by 1705 had finally left Hill Hall and gone to reside in Hillsborough Castle. The old Castle at Hillsborough, which became the residence of Peter Hill, eldest son of Sir Moyses, was simply an ancient stronghold of the Magennisses enlarged and renovated. Richardson, James Nicholson. -- "O'Neill of Munster," a poem, Newry, 1880; "The Baron's Dream," a Xmas carol, Newry, 1887. Born in 1846. A well-known manufacturer, of Bessbrook, near Newry. 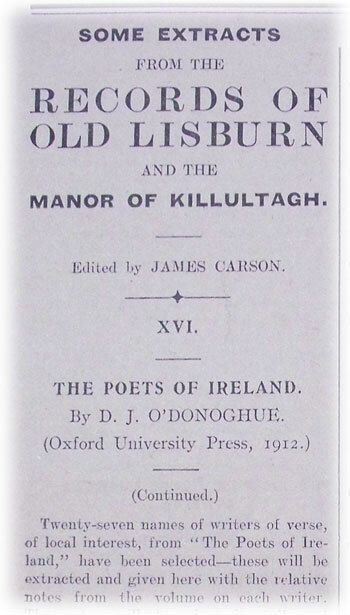 He published in 1915 "Reminiscences of Friends in Ulster." The volume contains personal notices and sketches of numerous Ulster families, including Barcrofts, Bells, Greens, Lambs, Malcomsons, Pims, Richardsons, Wakefields, etc., etc. 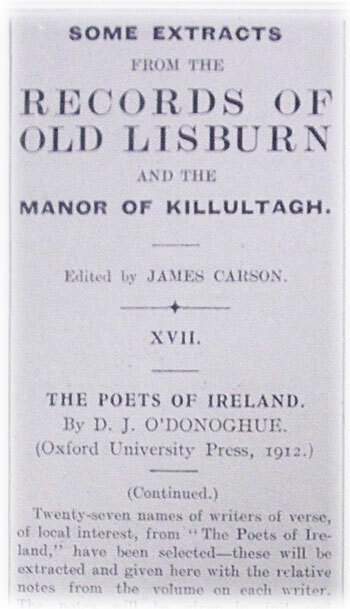 He also published "The Quakri at Lurgan," 1877; "The Quakri at Lurgan and Grange," 1899. 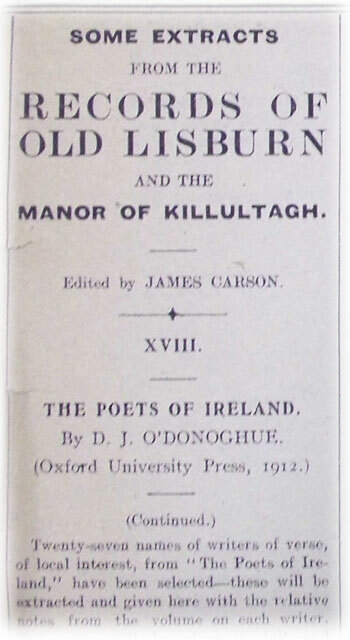 The "Quakri" is a long poem, or rather two poems, modelled on Macaulay's "Lays of Ancient Rome," and deals in a humorous manner with the views of a number of well-known "Friends" in Ulster on the propriety or impropriety of indulging in the singing of hymns at public worship. The volume contains in addition numerous exceedingly fine photographs. TWAS PRETTY TO BE IN BALLINDERRY. Trysting under the ivy tree! Though at heart I loved him, my handsome boy! Open at last your arms to me." And there, in the gloom of the groaning mast. We kissed our first and we kissed our last! Is sunk for ever beneath the sea. Phelimy Hyland, come back to me! This poem is taken from "Modern Anglo-Irish Verse" by Padric Gregory, 1913. A. P. Graves was the son of the Protestant Bishop of Limerick. He has written numerous songs and ballads. "Father O'Flynn" is from his pen. Was an Inspector of Schools, from, which position he retired in 1910. Owenson, Robert. -- THEATRICAL TEARS, a poem occasioned by "Familiar Epistles to Frederick Jones" (over signature of "R. N. O. "), Dublin, 1804. Father of Lady Morgan and Lady Clarke, was a clever actor, vocalist and musician. I have seen the music of Lover's song, "Rory O'More," attributed to him. Born in the Barony of Tyrawley, County Mayo, in 1744. He was for many years on the Irish stage, and is said to have changed his name from MacOwen to Owenson. He died on May 27, 1812, at 44 North Great George's Street, Dublin, the residence of his son-in-law, Sir Arthur Clarke, M.D. and was buried at Irishtown, near Dublin. Skeffington Gibbon, in his "Recollections," pages 142-144, says he was born in Sligo. He probably wrote "The Land of Potatoes," in Croker's "Popular Songs of Ireland." For further references see O'Keeffe's "Recollections," and "Life of Thomas Dermody." Owenson's daughter, Sydney, married in 1812 Sir T. C. Morgan, M.D., Dublin She published during her long life a large number of works, both prose and verse. Born about 1778, died in 1859. She was in receipt of a Civil List pension of £300 at the time of her death. Her best known work of fiction was "The Wild Irish Girl." His other daughter, Olivia, married in 1808 Sir Arthur Clarke, a Dublin physician. She was Born in 178S and died in 1845. Wrote many poems for different magazines and annuals. Published a comedy in five acts, which was successfully produced on the stage, entitled "The Irishwoman." "The Dictionary of National Biography" gives some information regarding Robert Owenson. It states that he was primarily educated at a hedge-school in Co. Mayo and acted for a short time as steward to a neighbouring landowner. Having removed to London and acquired a taste for theatricals, he applied to Oliver Goldsmith who introduced him to Garrick about 1771. He had a handsome and commanding figure and sang well. He appeared on the Dublin stage in 1776, and later became part proprietor of Crow Street Theatre. His subsequent theatrical ventures in various parts of Ireland did not meet with success. From the time of the Insurrection the handsome town of Lisburn had been the station for a troop of horse and a numerous company of foot soldiers. A splendid band accompanied them, and what, with the daily parades, inspection of troops and periodical bugle calls, the inhabitants were bidding fair to imbibe much more of the military spirit than is usually found to exist in provincial towns. Besides these sources of excitement, a respectable company of theatricals, under the management of Mr. Robert Owenson, father of the future Lady Morgan and Lady Clarke, added largely to the intellectual amusement of the citizens. Mr. Owenson's theatre was situate in the rere of Mr. Stewart's house opposite the road since made to Hillsborough, and the lessee himself and his two daughters resided next door. The society of the young ladies was much sought after by the merchants and manufacturers; but the ancient dowagers of Castle Street -- the Piccadilly of Lisburn -- and the other exclusives of that aristocratic quarter, entertaining a pious horror of the stage and its performers, kept aloof from them as if to touch the hem of their garment would have been to depart from the faith. Miss O'Neill, afterwards Lady Beecher -- then a young and rapidly rising performer, took the leading parts in the cast of characters, and rejoiced in the moderate salary of thirty shillings a week. ON HEARING OF MISS O'NEILL'S FIRST ENGAGEMENT AT COVENT GARDEN THEATRE. True excellence with modesty concealing. With kindness cherish it, for 'twas our pride. Erin ne'er sent a sweeter gift to thee. New lustre this will add to the unrivalled store. The unco guid and rigidly righteous of the "West End" of Lisburn were greatly opposed to "Owenson and his strolling players." At that time, it was quite customary for troops of these professionals to itinerate from town to town, and, for the nonce, transform a barn or hay-loft into a theatre, where the legitimate drama was produced, if not in the highest style of art, at all events so as to give intense gratification to the audience. Robert Owenson was a man of abilities very superior to that of most of his contemporaries. As a relation of Goldsmith, he possessed much of that wonderful man's versatility, and although when he went to London to try his fortune on the stage, he changed his name from MacOwen to that by which he was ever after distinguished, he was still, in heart and soul, an Irishman. He had great musical taste, and wrote some popular melodies, Rory O'More being one of his best in that style of composition. After his marriage, in 1778, he seceded from Covent Garden Theatre, where he had gained considerable celebrity in a long line of Irish characters, and became one of the choristers in Westminster Abbey. The salary was ample and the work light, but his heart yearned for the footlights, and he returned to Dublin, where for many years he performed with great success at Crow Street. In an hour of wild speculation, he was induced to build the unique theatre at Kilkenny, where Tom Moore frequently figured as an amateur. The result proved most disastrous, and ultimately sent him to the Bankruptcy Court. His wife died some years before, leaving him two daughters to educate and support, and once again he faced the world with a light heart and empty pocket. For several years he marshalled a troop of strolling players, and visited most of the provincial towns, occasionally appearing in some of his favourite characters, but never permitting either of his daughters to set foot on the stage. In 1803-4 Mr. Owenson's party performed regularly in Lisburn, at a theatre improvised out of a large hay-loft, in Bow Street. I remember, when a very little boy, spelling my way through an old playbill in which it was announced that the company would perform Goldsmith's admired comedy, "She Stoops to Conquer" -- Tony Lumpkin, Mr. Owenson; Marlow, Mr. Williams. A gentleman who was a frequent play goer in those days told me that he was in the house one night when Mr. Owenson personated Major O'Flaherty, in the "West Indian." His two daughters, Sydney and Olivia, occupied a box near the stage, and, during an interesting scene, as they talked ratter loudly to some of the officers of the garrison, who had strolled in for a small flirtation, one of the gods cried out -- "Its a shame for you, Miss Owenson, to interrupt your father's performance." This rebuke at once silenced the gossiper, and, in a few minutes afterwards, the box was empty. It seems most unaccountable that, in her autobiographical memoirs, Lady Morgan merely glances at her residence in Lisburn, and this is the more extraordinary when we consider that, in course of that sojourn, she passed through one of those phases of life which no woman ever forgets. During their residence in Lisburn, the society of the Misses Owenson was much courted. Sydney played the harp and sung her own songs in a style that never failed to enrapture her hearers, and Olivia accompanied her sister in most of the melodies. Francis Crossley, son of a spirit merchant in town, had fallen madly in love with Miss OWenson, who, by the way, was some years his senior. The "Wild Irish Girl," as this lady was familiarly called, had just then finished the rough copy of the celebrated tale, the Novice of St. Dominik, and, with a lover's enthusiasm, her adorer undertook to transcribe the work and make it ready for the printer. The sequel of the "good old story" followed all this. A proposal of marriage was made by Crossley, but, as he was entirely dependent on his father, and had no profession, and as his lady love was also without means, they put off the matrimonial contract, until the young gentleman had got into a position which would enable him to support himself and make provision for his wife. Lord Hertford had then considerable influence with the Indian Board, and, at Miss Owenson's suggestion, Crossley applied to that nobleman for a situation in the Eastern service. About this time, Robert Owenson and his troop of performers were about to leave Lisburn; the young people had entered into a solemn engagement to live for each other, and, as will be seen, Crossley faithfully kept his vow. The application to Lord Hertford proved successful, and, in the summer of 1806, he sailed for India, where he was appointed to an ensigncy in the Madras Infantry. For several years after his arrival in India, the young officer kept up a regular correspondence with Miss Owenson. He had been especially attentive to his duties, and was not forgotten by the authorities. In 1810 he got a lucrative appointment in the civil service, but having been sent far into the interior, and postal communication being exceedingly slow from that quarter, an interruption took place in the correspondence. Still the "Wild Irish Girl" held her supremacy in his affections. In the meantime, Miss Owenson had been devoting all her spare time to literature, and her popularity as a novelist had risen far beyond her most dreamy anticipations. Her sister married Sir Arthur Clarke, a Dublin physician, in good practice, and her own income from the copyright of her works was pretty handsome. But this was not all. Her writings abounded in a spirit of independence then little known. She had baldly laid bare the injustice with which Ireland had been governed; and, although a Protestant and a firm believer in the Episcopalian creed, she felt keenly for the wrongs of the Catholic, and, with a woman's love of battling for the weaker side, she fought hard for the Emancipation of her fellow countrymen of that Church. This courageous course raised many enemies against her. The "Quarterly Review" handled her novels with merciless severity, and, although there was much, to condemn in many of those works, still the severity with which she was assailed called forth immense sympathy, and she became the petted protege of a powerful section of the lending aristocracy. And now comes the romance of one remarkable portion of her life. Crossley's correspondence, as I have stated, had been interrupted from no fault of his, and Dr. Charles Morgan, a widower, with a daughter nearly grown up, and some pretensions to literary taste, had been paying court to the gifted authoress. The Lord Lieutenant knighted him for purpose in aiding the suit, and at length he was accepted, and the marriage was arranged to come off at Baronscourt, the seat of Lord Abercorn, in the County Tyrone. In August, 1812, the ceremony took place, and when the wedding party came back from church several letters, addressed to Miss Owenson, were handed to the bride. One of them was from Lieutenant Crossley. He accounted for his silence by stating that he had been sent to an isolated island, but, having gained a high position and an ample income, he claimed the hand of his affianced, and sent money to pay her passage to India. Of course, it was then too late; the die had been cast; but Lady Morgan never forgot that chapter in her own romantic history. A short time before her death, and when fourscore years had passed over her head, she related the story to Sir J. K. Tennant with all the excitement of girlish recollection. Crossley got a captaincy in 1824, and also the usual leave of absence. He visited Lisburn, and married Miss Stewart, of that town, in the autumn of the same year. On his return to India, and while passing through London, he called on Lady Morgan, introduced his handsome wife, and spent a most exciting evening with the object of his first attachment. ON THE CELEBRATION OF THE TWELFTH OF JULY AT LISBURN, IN THE YEAR 1823. As regiments march'd to the Boyne. And freed us by Nassau this day. Inscrib'd with the words "No Surrender,"
For each gave the true Purple sign. Our hymns of thanksgiving to sing. He was known as "The Fermanagh True Blue." Born in 1800 near Fintona, Co. Tyrone. He also published the "Orange Minstrel" and other works. 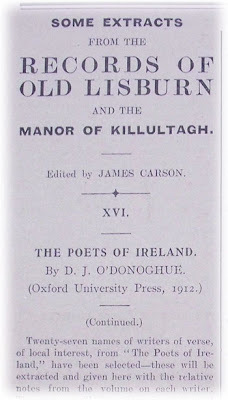 In the "Ulster Harmonist" are several poems from the pen of the Rev. John Graham, born in Co. Longford 1774, died at Magilligan, Co. Derry, 1844, who wrote and published numerous volumes of historical poems. He is described by O'Donoghue in "The Poets of Ireland" as "the best of the Orange poets." Flecher, Henry M'Donald. (See notes, Article XIV. ), -- Born in Ballinderry, Co. Antrim, about 1840. "Northern Whig," 15th November, 1902. Article entitled "A Local Reminiscence: The Poet of 'Bonnie Portmore,'" by A. Brown. Henry M'Donald Flecher died at Blossom, Texas, on 21st October, 1902. He taught school successively at Ballymaglaff, Comber, and Moneyrea, all in Co. Down. In 1866 he removed to Belfast, and taught for a short time in Springfield National School. In 1867 he resigned the occupation of teaching, and for three years was cashier in Crumlin Road Mills. In 1870 he emigrated to Texas. In religion he was a Unitarian, and in politics an advanced Liberal. On a fiel' that's a body's for iver! It's there ye have courage to "lay down yer bone"
And give thanks to the bountiful Giver. Than an emperor's wealthiest vasal. As nate a wee spot as you'd see! And a bite for a hungery neighbour. Till the craps are the counthery's wonder. But conscience gives me my directions. I'm lord of my acres for ever! As purty wee fiel's as you'd see! M'Cloy, Samuel. -- Born in Lisburn 1831 died at Balham 1904. Figure painter. Referred to in Strickland's "Dictionary of Irish Artists." M'Cloy was apprenticed to James and Thomas Smyth, a firm of engravers in Belfast, and also studied in the School of Design. Later he studied in the Central School, Somerset House, London, and was appointed in 1853 Master of Waterford School of Art. In 1875 he returned to Belfast, and remained there until he went to London in 1881. He occasionally exhibited in the Royal Hibernian Academy between 1862 and 1882, contributing figure subjects and scenes of Irish domestic life. He also contributed a few works to London exhibitions 1859 to 1891. In the Victoria and Albert Museum is a drawing of "Black Grapes" by him, and in the Belfast Art Gallery a small oil picture of a girl standing by the sea, entitled, "Where the White Foam Kisses Her Feet." Mr. F. A. C. Mills, Cliftonville, Belfast, has an oil painting and a number of water colour drawings and sketches by him. He was a cousin of the late James and Matthew M'Cloy, house painters, Lisburn. Lived in his early life in Johnson's Entry, off Castle Street. This locality, it is said, eighty years ago laid claim to a certain amount of respectability. Mr. W. J. M'Murray, J.P., Lisburn, owns several of the artist's pictures. Bayly's "History of Lisburn" next week. Stott, Thomas. -- THE SONGS OF DEARDRA, AND OTHER PIECES, London, 1825. This once well-known writer, who is referred to in Byron's "English Bards and Scotch Reviewers," was born at Hillsborough, Co. Down, on April 25, 1755. He was a rich linen-bleacher in Dromore. A great friend of Dr. Percy, Bishop of Dromore, he was first a violent Republican, it is said, afterwards becoming a strong Conservative. He died on April 22, 1829, at his residence in Dromore, and was buried in the Cathedral grounds. There is a lengthy inscription on his tombstone, which was erected by his son, John Stott who died in Coleraine on May 17, 1860). Thomas Stott wrote numerous poems for the United Irishmen's "Northern Star," "Belfast News-Letter," London "Morning Post," "Poetical Register" (1806, etc. ), and other periodicals over the signature of "Hafiz," and his own name. He was the "Thomas Stott" of "Waringstown" and "Banks of Banna," who wrote for Walker's "Hibernian Magazine," 1779-80. In the same magazine for August and November, 1801, are poems by him, two of them signed "Hafiz Dromore." There is a poem of his among Rev. Samuel Burdy's verses, and another is in Madden's "Literary Remains of the United Irishmen," taken from "Paddy's Resource." In broad St Giles's or in Tottenham Road. Or Common Sense assert her right again. Byron afterwards wrote -- evidently regretting his harsh and biting words -- "The greater part of this satire I most sincerely wish had never been written -- not only on account of the injustice of much of the critical, and some of the personal part of it, but the tone and temper are such as I cannot approve." In Dromore Cathedral are two handsome windows recording the children and grandchildren of Thomas Stott. The portion of the transept in which the windows are is known as the "Stott Niche." The Mount of Dromore formed the subject of a beautiful poem by a youthful poet of Dromore, named Thomas Romney Robinson, who lived at the time Dr. Percy was Bishop of Dromore. When Robinson was in his 49th year a volume of his poems was published. On the death of William Cunningham, by Master T. Romney Robinson. And claims on earth, the tribute of a tear. Sighs 'midst the whirl-wind of his rushing storms. And o'er her favourite's tomb in sorrow bends. And truth inspired him from her heavenly throne. Deep in the bosom of the wintry ground. And from the prospect turn thy dazzled eyes. William Cunningham was born at Maharabeg, in the parish of Dromore, on the 19th of March, 1781; and while he was a poor weaver boy, having received the first rudiments of education at one of the Bishop of Dromore's Sunday schools, had by reading such books as he could borrow made so considerable a progress, that in the autumn of 1800 he presented his Lordship with a copy of verses requesting the loan of books. The Bishop being struck with the marks of genius displayed in this poem (which is unfortunately lost), rescued him from the loom, and placed him at the Diocesan school of Dromore, where his application was so diligent, that in about three years he had read the principal Latin and Greek classicks. Being thus qualified to superintend the education of youth, which had been the object of his wishes, he was received early in the year 1804 as an assistant teacher in the academy of the Rev. Doctor Bruce of Belfast, where he was distinguished for his diligence and skill in preparing the boys under his care to be examined before the summer vacation in that year. But by this time such strong symptoms of a consumption had appeared in his tall, thin, and slender frame, that he could not any more return to his charge; and his declining health confined him to the house of his poor mother, near the turn pike gate between Hillsborough and Dromore, where he continued to experience the kindness of his former patron, and was most generously attended by Sir George Atkinson, an eminent, physician in the adjoining town of Hillsborough; but his case was beyond the reach of medical aid, and terminated fatally on Thursday, the 27th December; he was interred in Dromore churchyard on the Saturday following, having nearly completed his 24th year. On the Peace -- 1801. Bids Europe drop the deathful arms. For husbands, sons, and fathers slain. To drench her fertile fields with gore. Blithe shepherds and their flocks will play. That long hath aw'd the vast profound. Her constant aim -- the public good. To mar the labours of the year. In ev'ry grace divinely drest. While love and friendship warm each breast. Lest war shou'd him to battle lead. Her fav'rite swain to battle call. From thee her choicest blessings flow. Thomas Percy, Bishop of Dromore, was the author of several valuable books, and was also a poet of no mean order. His ballad, "O Nancy, wilt thou go with Me?" written to the lady who afterwards became his wife, has real merit and sweetness. Near the town of Dromore, between the Dublin Road and the River Lagan, is a handsome monument in memory of Bishop Percy bearing an inscription written by Thomas Stott. "A Ramble through Dromore," "Banbridge Chronicle" Office, 1886, by John F. Mulligan (Linen Hall Library), contains valuable and interesting information regarding the town and neighbourhood of Dromore. THE LAND WE LIVE IN. To hurt -- the Land they live in. That wound -- the Land they live in. Should ever to the miscreants show. That hate -- the Land they live in. But none at wicked schemes connive. To blast -- the Land they live in. To guard -- the Land we live in. Would crush -- the Land we live in. To help -- the Land we live in. And bless -- the Land we live in. How much is that in todays money? Over the years I have seen many postings in which someone has asked the question "How much would that be today?" in regard to an ancestor for whom they had a source which gave a sum of money for wages, a settlement, something they sold... or stole... etc. It's a question that has sometimes raised great debate and several websites such as www.measuringworth.com and www.nationalarchives.gov.uk/currency/ have been set up to answer it. But if you have an iPhone/iPod/iPad you can now get an app for that. 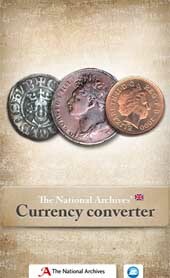 Using records from the National Archives, RevelMob and historian Nick Barratt have developed an app called "Old Money". Our records are not just the first draft of history, but are increasingly being used in smart ways by developers to create innovative products and services for anyone who needs instant access to practical historical information. The Old Money application enables users to make sense of historical facts and figures which might otherwise be meaningless, such as the 1761 sale of Buckingham Palace for £21,000 or William Shakespeare's annual salary in 1599 of £100 a year. Details can be found on the RevelMob website at www.revelmob.com/currency-converter. M'Kowen, James. -- A clever and popular Ulster poet, born at Lambeg, near Lisburn, Co. Antrim, February 11, 1814, and received an elementary education in the district, and at an early age was placed in a thread manufactory. He afterwards obtained employment at the bleach works of Messrs. Richardson, Belfast, and there spent the remainder of his active life. 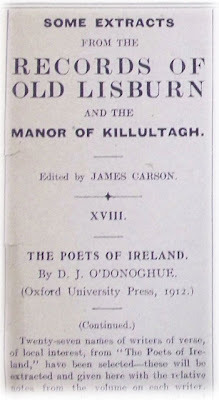 About 1840 he began to contribute verse to Ulster papers, especially "The Northern "Whig," over the signature of "Kitty Connor," and became a greet favourite as a poet. To "The Nation" soon after he sent a few poems signed "Curlew." He died on April 22, 1889, and his poems, which were never published in book-form, were entrusted to his friend, Mr. Robert May, of Belfast, who at one time hoped to publish them. M'Kowen is represented in Connolly's "Household Library of Ireland's Poets" (where it may be mentioned his name is mis-spelled), by a poem or two, and in Varian's "Harp of Erin," 1869, by nine pieces. M'Kowen's most famous piece is his humorous song, "The Ould Irish Jig." Mr. M'Kowen was born in Lambeg, February 11, 1814; died at Beechside, Lisburn, April 22, 1889, and was buried in Lambeg Parish Churchyard. After the very brief schooling of the time he was employed in the thread manufactory of the Barbours at Hilden, but for the last forty years of his active business life, he held a post in the Glenmore Bleachworks of Messrs. Richardson, Sons and Owden, who granted him a pension in the days when his working strength had passed away. Like so many countrymen of the older days -- more then, it is to be feared, than now -- he was a great reader, Shakespeare, Scott, Burns, Byron, and Moore appear to have been his favourites. He finds a place in the Valhalla of the Dictionary of National Biography. His maternal grandfather took a leading part in Lisburn's circle of progressive politicians. During the famous struggle for electoral independence in 1783, which ended in the return to the Irish Parliament of Colonel Sharman and William Todd Jones as the popular members for Lisburn, John Johnson was one of the pioneers who fought for the freedom of the franchise. Then again it is on record that James M'Kowen's mother was possessed of keen literary taste. Robert Owenson's party of players had their improvised theatre in the rear of John Johnson's inn, in Bow Street, which would appear to have been situated where Mr. James Stewart's house afterwards stood, opposite the new road to Hillsborough. Miss Johnson, afterwards Mrs. M'Kowen, spent many evenings with Sydney Owenson -- later the celebrated -- Lady Morgan and the other members of the Owenson family. Another daughter of Owenson, Olivia, married in 1808 a Dublin physician, Sir Arthur Clarke. A young actress, Miss O'Neill, who took the leading part in the caste of characters in Bow Street afterwards became Lady Beecher. James M'Kowen inherited much of his mother's taste for the footlights, and in his earlier days he frequently walked from his place in his place in Lambeg to witness some special performance in the Belfast theatre. "Few men enjoyed life, with greater zeal than he did; he made many friends for himself, and his genial countenance and happy disposition never failed in imparting to others a share of his joyous temperament." It is a pleasant character to leave behind when one's time for going has arrived. 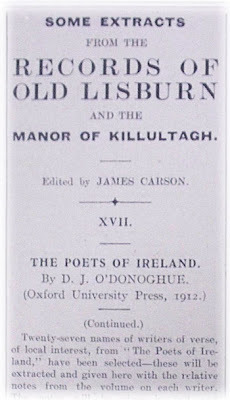 He wrote under the pen-name of "Kitty Connor," and contrived verse to various Ulster papers, especially "The Northern Whig." To "The Nation" he sent a few pieces signed "Curlew." Mr. Robert May, Belfast, has made a complete collection of his poems, which he hopes to publish in book form at an early date. Charles Duval's music-hall version of the "Old Irish Jig" was often quoted as M'Kowen's, which annoyed the poet very much. He contributed "Bonnie Twinkling Starnies" to Graves' "Book of Irish Poetry." your like is not under the sun. compared with an old Irish jig. our own Irish jig we will dance. and, faith, I approve of her taste. look up with delight in their face. and played his own harp to them too. that pleased the old villain so well. When eve shed its deep mellow tinge? By the ocean waves' whispering fringe? The voice of the wailing curlew. To herald the birth of the morn. But give me, Oh! give me, that song from, the cloud. Borne far on the wings of the gale. Shall lie cold as a clod of the vale. But they seemed to be saying, "John Blaney you're dry." And it echoed the answer, "Poor Blaney you're dry." And the birds in the bushes sang, "Blaney you're dry." With my burning head aching, "Poor Blaney you're dry." He would not dismiss me, he knew I was poor. And I'll wet your ould whistle, "Poor Blaney you're dry." With his high tax on whiskey, "Poor Blaney you're dry." There is some diversity of opinion regarding "Blaney You're Dry." A different version, and one not at all as good as that quoted, has been current for many years in Lisburn. The fifth verse, as here given, is a decided improvement on the version generally in use. John Blaney lived in Lisburn, but being on "a spree" in the country, all night, and passing through Lisnatrunk in the morning was on his way home to Lisburn, to get "a curer," hence the first line, which differs from another version I have seen. He had one leg amputated above the knee and used a crutch. Blaney was an educated man, and gifted with a lot of talent had he used it aright. In early life he assisted the organist in the Cathedral by blowing the bellows, but being of an independent mind, he ran foul of the Rev. Dean of Ross, who dismissed him. Being then without the means of earning a living, he started a children's school in a dwelling-house in Antrim Street (I was a pupil at that school for one week), and in his spare time mended bellows. After a short time he gave up the school and followed the latter avocation. He was made welcome in both town and country, especially the country, where he made himself at home, as he played the fiddle well, though he never carried one; and being able to make a speech, was welcomed by the farmers, especially at dances, halls, or gatherings. He was distantly related to Henry Monroe, the Irish general and patriot. All his relatives lived in Lisburn and some live here still. There was a "pub" in the Market Square, known as the Carman's Inn, kept by a man called Savage. Long strings of carts and horses pulled up at his place going to and coming from Belfast, and he had the privilege of serving them at all hours, night or day; but, although very civil, was very strict. He allowed no man in charge of a horse to get more than two drinks, and if they insisted in having more his word was always, "Car on, Mahager, you will get no more here." So he was nicknamed "Old Mahager," and was better known by that name to the men on the road than as Mr. Savage. He knew Blaney in better circumstances, and Blaney also knew him. M'Curry, Samuel S. -- IN KESWICK VALE AND OTHER POEMS, London, 1907. A resident of Co. Dublin. If only thoughts, not deeds are meant. The music in our hearts, would chime. THE SMELL O' THE TURF. And I gaze on the scene of my childhood with tears. Mr. M'Curry has two more volumes ready for the press, and hopes to bring them out when the war is over and conditions are more normal. Since retiring in August, 1915, he has devoted almost his whole time to work amongst our soldiers, both in France and in this country. Although living for the greater part of his life outside the bounds of Ulster, he has never forgotten his native province, and Ulster, her people and customs, have always occupied a very warm place in his memory and affection.